When the masses first realized the power and reach of the Internet, it was a bit like the fences being torn down at Woodstock. They weren’t very effective anyway, but once they were down, everyone, the dirty, the silly, the outrageous, and the dull stormed into the mudpit. In the days before the Internet, it was mighty hard to get published in any sense of the word. Writers without the backing of a traditional media house had to resort to ‘zines, “vanity” presses, or just weeping quietly over their Chai teas in sporadically attended coffee-house gatherings. All that would soon change. While there still may not be a lot of money out there for the majority of writers, there is coveted exposure. Consider this. 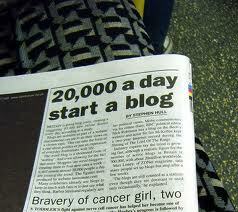 In 2003, there were 500,000 blogs on the Web. By 2004, there were 4 million. The latest statistics available reveal that by December of 2010, there were 152 million blogs. Some “real” writers were, and are, skeptical. And with the dawning of social media such as Facebook, the chance for anyone who fancies himself a writer to post whatever and whenever the muse strikes them, only makes many of those authors roll their eyes even farther back into their heads. While Alexie’s sonnet does not speak directly about the irritations many published authors feel about lesser known or obscure writers, the themes comes across as a bit cranky, and perhaps somewhat patronizing towards those who put their thoughts out there in written form for all to see. I have spoken to many authors who do not feel blogging is “real” writing (and granted, a lot of it is not, but some of it is). And Facebook?…. PLUUUEEEZE. The way I see it, the good writers will eventually win out and there is no harm in letting the poorer ones at least try to improve their skills. Many of my friends are writers, and they regularly post their poems, essays, or just general witticisms on Facebook. The feedback I personally get is invaluable, and I enjoy being able to be exposed to the thoughts of my friend and colleagues, as well as helping them in return by way of comment, support, or constructive criticism. While writers like Alexie may poo-poo the common man and his attempt at communicating, other writers are more accepting. I was surprised when I asked some very famous authors like Marge Piercy to “friend” me (not just become a “fan” of her page) and she accepted, as did Albert Brooks and Lewis Black. Now, I can’t know if they personally ever view their Facebook pages, but they might and who knows? I’m one of the 152 million vying for a spot at the table in Olympus.